For each of The Rep's Mainstage productions, we host four post-performance discussions where members of the cast return to the stage to field questions from the audience. These discussions are always packed with inside information on the production – little behind-the-scenes tidbits that are akin to the director's commentary track you might hear on a Bluray or DVD. 1. Those gorgeous chandeliers? Yeah, they almost ended up in a landfill. The beautiful chandeliers that adorn the Pemberley set were actually discovered in a pile of rubble in a parking lot. The Rep's props carpenter Ralph Wilke painstakingly restored them to their former grandeur, one piece at a time. 2. Even the cast wasn't anticipating the number of laughs they're getting. Cast member Justine Salata (Mary) remembers the cast's reaction when they performed the show's first previews: people were laughing at way more moments than they had expected. "We weren't prepared for how funny this show was," Salata said. "I mean, we thought it would be delightful, with lots of inside jokes for Jane Austen fans." "We knew where the jokes were," co-star Peterson Townsend (Mr. Bingley) explained. "But we didn't know if it would translate to long laughs." "Like, laughs so long that the next person has to wait to say their line," Salata added. 3. Most of the cast watched the 2005 film adaptation of Pride and Prejudice after the first rehearsal. This film version of Austen's novel is a favorite of director Jenn Thompson – the look of the movie also inspired set designer WIlson Chin's take on Pemberley. Watching the film after the first rehearsal was partly as a way to school Miles Jackson (Arthur), who didn't really know Jane Austen coming into the production. But it quickly turned into a big cast bonding party. 4. Cast member Kim Wong (Jane Bingley) is actually knitting onstage. Kim, who you may remember from our production of Hamlet, has used this show as an opportunity to really polish her knitting skills. As her very pregnant character prepares for the arrival of a new daughter or son, she spends much of her free time knitting little items of baby clothing. Kim actually knits these items live on stage during some of her scenes, and shared some of the results on Instagram. Kim plans on donating the finished items to a local hospital once the production ends. 5. The costumes are as fun to wear onstage as they are to look at. 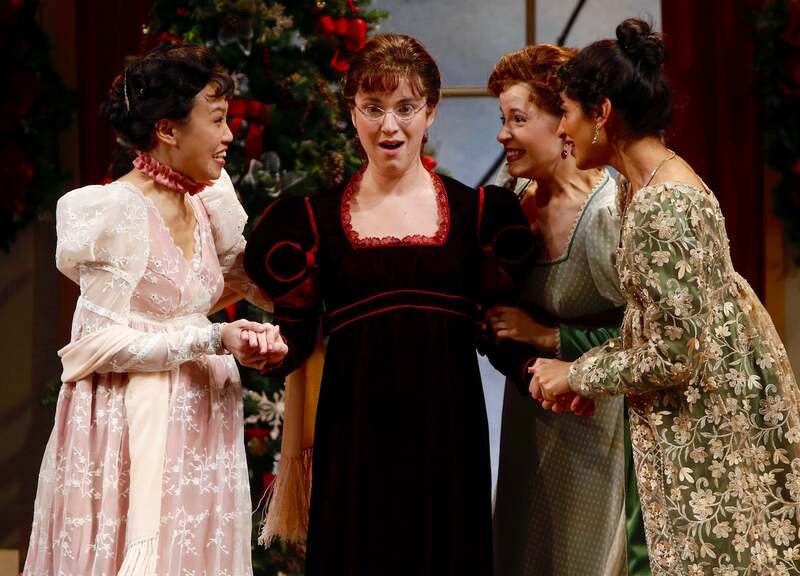 One audience member wanted to know if the show's costumes were all original creations, or if The Rep had used some previously created outfits in our production of Miss Bennet. As it turns out, nearly every item of clothing was hand-stitched specifically for this show. Given the incredible rainbow assortment of costumes on stage, that's really saying something. "Putting on the costume really helps bring you into the world of the play," Kim Wong said. The cast joked that the men actually take longer to get out of costume than the women in this show – their outfits are just as elaborate, as it turns out. But Miles Jackson says it's quite worth it. "I've never felt classier," he quipped.